Check out 3D printing at UNHM! Check out your Professor’s Blog! The human population growth has increased dramatically. However, the majority of the expansion has happened more recently then people might expect. Over many years researchers have gathered information about man kind that we then used to develop predictions about where the growth of the population is headed. When the number of beings in a specific population increases, this is known a population growth. To most people, or at least for me, the term population growth doesn’t mean much. The world seem to be handling the number of people just fine. 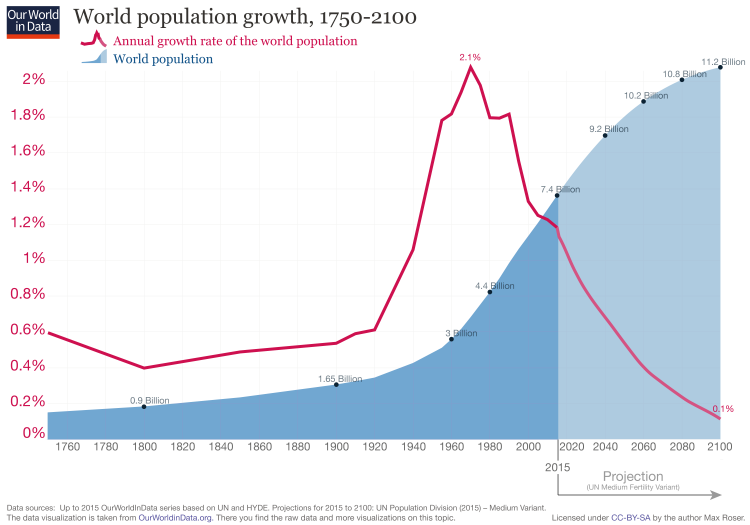 But, when you look at just how much the population has really grown, you start to wonder if the world is actually doing well. Prior to 1804, the human civilization had a fairly sable population. Around that year the population started to climb and it reached the one billion mark. from that point forward the rate of growth has increased incredibly fast. Reaching the two billion mark took about 124 year. 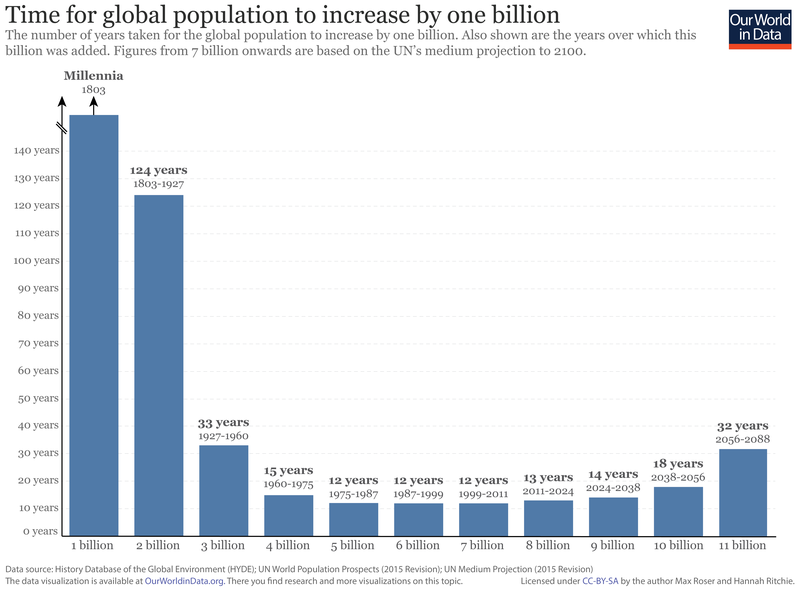 This is a long time compared to the next 5 billion people that populated over only a span of 84 years, roughly twelve to fifteen years per billion. Now the human population is around 7,714,576,923. That is a staggering number. This number is especially scary knowing that it has been increasing about 80 million a year or almost 1,500,000 each week. However, the rate at which the population grows is about 50% less now then it previously was. Though the rate of growth has slowed, the population is still growing and is projected to continue to increase. When researchers attempted to calculated the populations trajectory, they took into account what would happen if each family size varied by just half a child. (which doesn’t make sense to me. why calculate half a person, what even is half a person.) The results of this is actually rather major. I found this to be extremely interesting. What i also found interesting was seeing Japans population growth and how if differs from the United States. China had a one child law where males were more desirable than females, due to may reason i.e. labor, passing down families names. But looking at Japan you see a huge decline in births around the 1965 time frame. Given maybe two years it corrected it self but ever since then the births have become less and less. The death rate has maintain a constant level, yet based on this projections the death rate with supersede the birth rate, and not enough births will replace those who have died leaving a population at risk. Just something interesting to me, otherwise good job and great pictures. Seeing how quickly our population grows is there a possibility that there needs to be a limit on how many kids people have? I know this sounds insane but say each person was allowed to have on kid, (so if say two people were married they could have two kids total) do you think this might slow down our incline of population? Eventually we are going to run out of space, yes people die but are the amount of people die enough to equal out the amount of people being born so there’s room for everyone? Adding on to what Alyssa was saying about limiting the amount of kids each person can have, what would society turn into? What would happen if there was more than one child that happened? Would there be repercussions or what would happen to that child? They idea for this has been mentioned in other countries, but ultimately turned down because of the caos that it would bring.